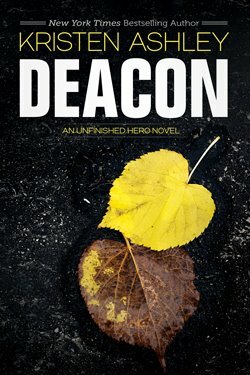 After reading Raid, I couldn’t wait to dive into Deacon’s story. He was described as utterly cold… a man with a mask. I wanted to know him. Wanted to know why he exuded a mask of indifference. With whom and how he would fall in love. What would his story be? I can tell you his story was a gradual crescendo, an unfinished tale that spanned years as Deacon longed to bridge the chasm between who he was and who he wanted to be in the face of the most beautiful, disarming woman he had ever met. It was six years of pining and retreating, of inching closer only to walk away, a slow burn that sizzled until one night unexpectedly changed everything. I felt as if Deacon and Cassidy’s story was simultaneously intense and tranquil. There was so much inside of Deacon… ugly, volatile things… but with Cassidy, and surrounded by the idyllic mountains of Colorado, their falling in love was beautiful and inevitable and ohsoright. But rewind six years to when Cassidy uprooted her life at her father’s farm and moved to a new place with a boyfriend and a dream. Cassidy Swallow moved to Colorado to take over some remote cabins in the mountains, hoping to turn them into a haven people would visit. She was willing to work hard to make her dreams come true. To turn these eleven cabins into a thing of beauty. Her boyfriend, Grant, however, was not willing to do the work, not willing to share in these hopes. And it was one day, while they were bickering, that a shadow, big and looming, stood at her door, renting cabin eleven. Deacon was a broken man, but a man that hid all that hurt and anger behind a shroud of indifference. He didn’t care about anybody. Didn’t let anyone in. He was a badass bounty hunter who focused on the job and nothing else. But from the moment he met Cassidy, a crack began to spread in his impenetrable shield as the pull to be with her tugged at him incessantly. Something he pushed down and away year after year after year. I loved that their story spanned years, as each of them changed, as their lives evolved, but the irrepressible pull between them just kept growing stronger, despite Deacon not giving Cassidy anything to hold on to as hope fled every time his black Suburban left her parking lot. But one night, Deacon’s control slips and everything changes. All that pent-up desire explodes as these two people fit so perfectly together. The slow burn finally blazes and it was wonderful to experience that long-awaited payoff as a reader. I love the stories that take time and simmer, only to culminate in a way that leaves you feeling full-to-bursting happy. Yet their story truly takes off as they begin their tumultuous time together, their life a pendulum swinging between secrecy and honesty, between a past that broke a man and a future that promises to heal him. As Deacon tries to keep Cassie away from all that’s ugly in his life—past and present—we see Cassie fall more in love with a man she knows nothing about. And the deeper she falls, the more those questions burden the promise of a happy ever after. And when the ugly truth is unearthed, would Cassidy stick around? Could Deacon let go of a past that had gripped him so completely for so long? This was undoubtedly another example of Kristen Ashley’s prowess at writing a story that draws the reader in so fully. I’ve said it a million times, but my addiction to KA books intensifies with every book I devour. There is just something magical that happens instantaneously, from the flip of the first page, that makes me care deeply for her characters, for their story, for their future. I love so much that we see people we care about appear in each book. I love seeing unexpected connections as the tapestry of the world she’s created is woven more tightly together, character by character, story by story. And if impeccable storytelling isn’t enticing enough, I should also mention that this installment is particularly superhot. And that steaminess is perfectly balanced with a whole lot of heart and emotion. There was even some wonderful witty moments between them, as I truly felt their happiness of being together consume me so fully that I was downright giddy. I anxiously await the next KA book, ready to fall in love all over again with a story penned in her one-of-a-kind voice and style. I’m all in. KA is my favorite author and I think this series is my favorite after reading them all. Thanks for the great review too.